Hey! Look at this, it's the first random post of the year! I had my heart set on posting a recap about the outcome of my Ravellenics (hint: it was meh), as well as some of the WIPs that are currently on my needles, but my weekend didn't pan out exactly as I had plan. The Munchkin was in a perpetual craptastic mood complete with "Rock Brain" all.weekend.long which I'm sure any parent can agree, can make for quite the mentally exhausting time. Writing up blog posts was the last thing on my mind. Even now my brain is still feeling a little scattered, hence the random post. ♥ I finished the first (of hopefully several) not-so-secret secret projects a while ago (yay!) and a few days ago I cast on a new one. I had cast on the beginnings of a shawl using a technique that I liked and just kept going with it, not really thinking about where I was going to go with the shawl in general. I didn't have a game plan and somehow misjudged the amount of yardage I had to work with and now I've got some thinking and planning to do. Ugh. So what's a knitter to do in a situation like this? Put that project in time out and cast on something new, that's what! ♥ I've also finished my Jeck socks and of course right after I had immediately cast on a new pair of socks. This will be pair #5 for the year. Oh yeah! I've gotta keep this sock knitting momentum going! ♥ Aside from filling my sock drawer with squishy hand knit socks, one of the biggest reasons why I'm going crazy with the sock knitting is to try to make a dent in my sock yarn stash (I used to not consider sock yarn as "stash"...um, I think that backfired). And yet, here I am cruising all the online shops for more yarn to make socks with. The whole point is to dwindle down the single skeins, not add to it! ♥ At the beginning of last year I was totally gung-ho on keeping track of my stash - what came in, what went out, what I sold... But then in the summer I had stopped updating my spreadsheet. I think that was around the time that I had stopped knitting but was still accumulating yarn. Yeah...it was starting to get depressing. 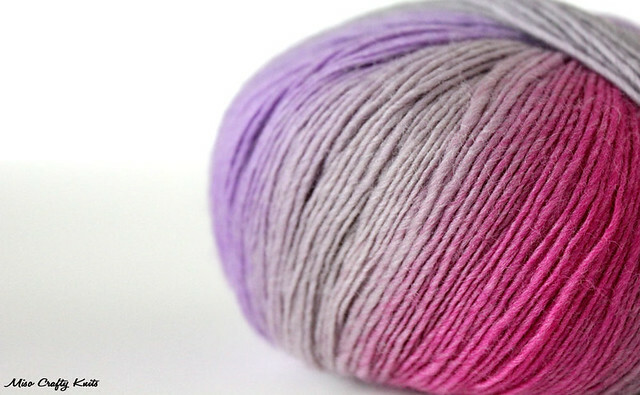 What's the point of keeping track when nothing was leaving the yarn house stash? ♥ Fast forward to today and yes, I've started up a new spreadsheet and I'm determined to keep up with keeping track of the stash this year. So how am I doing? Um...well...old habits die hard? I really don't know what's going on. I really haven't been buying yarn (other than a few skeins to add to current stuff to knit up those not-so-secret secret projects) and yet the stash is still finding a way to grow. Personally I don't think this is a bad problem per se, but when you're trying to whittle the stash just a tad, every new skein really does make a difference! ♥ Even though I've got a pair of socks and a shawl (well, 2 shawls) on the needles, I'm also feverishly knitting away on a sweater project too (which I have yet to blog about!). I had started this sweater last year and then for some reason I put it down - most likely because I got distracted by something shiny and new - and the sweater just never got finished. I'm hoping to get it not only finished but blocked and ready to go within 2 weeks. Why in 2 weeks, you ask? So that I can wear it while at Vogue Knitting Live in Seattle! ♥ You heard right. In 2 weeks I'll be heading across the border to Seattle with some knitterly friends to attend the awesome event that is Vogue Knitting Live. I'm SO excited!! Will you be going? ♥ Please don't ask me if I'll be purchasing any yarn while at VKL. But at the same time, please don't judge me if I come back weighed down with a hefty haul. I'm weak!! So very, very weak in the eye of woolly yumminess!! ♥ I'm already prepping myself now to exercise willpower and restraint. We'll see how this works out the second I enter the Marketplace. ♥ Just a heads up that I will be closing my Etsy shop for the few days while I'm away in Seattle. ♥ Speaking of the Etsy shop, I'm hoping to do a whack load of sewing this week as I won't be able to do much in terms of sewing during the Munchkin's spring break, which is 2 weeks long starting next week! Ack!! I'm currently trying to plan and schedule things to do to keep the Munchkin busy during that time, and am hoping that I can somehow squeeze in some sewing time here and there. But I'm not going to hold my breath. ♥ Some potential good news though, I just might get even more knitting accomplished instead during that time. But again, I'm not going to hold that aforementioned breath. Ok, speaking of the Munchkin and crafting, I better throw tonight's dinner in the crock pot before I head back to the Munchkin's school for a little bit (I had volunteered my time to do some menial tasks like gluing artwork into each kid's sketchbook and stuff). It's such a dreary, grey and rainy day that I'm sure I'll be rushing back home in time to sew up a few bags before rushing back to the school to pick up the kiddo. Oi. I better get cracking! So jealous of the VKL trip! It sounds like a ton of fun :) Looking forward to the recap!